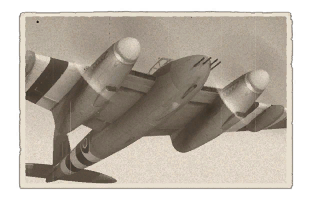 The Mosquito FB Mk XVIII is a Rank IV British twin-engine fighter with a battle rating of 4.0 (AB) and 3.7 (RB/SB). It was introduced in Update 1.39. The Mk.XVIII also known as the "Tsetse" was a converted Mk.VI "FB". In this aircraft all four Hispanos were replaced with a single Molins 6-pounder Class M cannon (57mm) which in itself was a modified QF 6-pounder anti-tank gun fitted with an auto-loader to allow for both semi- and full automatic fire. When used in AB it is often best to find lone targets away from the main action due to it's more specialized armament. Like the Mk.VI before it, the Mk.XVIII has no defensive armament; even a well flown bomber may take you out. The 6-pdr can take out all three kinds of tanks (light,medium and heavy) as well as light pillboxes, the latter being the easiest as they are stationary. Line up your gun sights, aim centre and fire. The distance you fire from is up to personal preference but a good start point is 600m. Light tanks can be taken care of from any angle and medium tanks can be dealt with from the sides and rear but aiming at their front may cause bounces and is not a guaranteed kill. Heavy tanks are like mediums but a frontal attack is most certainly going to bounce this time. Also when attacking tanks don't forget that they move and you will have to judge its location before you fire. A good way to practice this is to jump into a custom game and practice on people driving tanks as they can be harder to hit then a AI controlled vehicle. In RB, as with Arcade Battles, you want to try and find some targets away from the main action, this can be easier in RB and SB as there can be less people and the spotting distance is reduced, stick down low and use the terrain to your advantage, learn to fly low and fast weaving up and down hills and valleys. The same applies with SB but you are confined to the cockpit. Some tips for taking off in both RB and SB: In RB apply flaps to take off and set 100% throttle (not WEP). Around 100kph/60mph, level the nose down parallel to the ground and wait till you reach around 200kph/120mph, then gently pitch up and you should slowly ease into the air. As for SB, apply throttle little by little and some counter steer to the right as torque from the engines will try to turn you to the left. Follow as with the RB take-off and bring the nose parallel with the ground around 100kph/60mph and pitch up a little once you reach 200kph/120mph to ease into the air. Stable gun platform, moves only a little even when firing the 57mm Mollins Class M cannon. Centralized guns, allows to destroy targets at ranges up to 2km with some practice . Very good in its role as attacker. Large cockpit with good visibility for would-be and experienced SB pilots. 57mm Mollins Class M cannon has high penetration. Massive fuel load (longer time in air). Not the most nimble of aircraft, at times it can feel very heavy and clunky especially with the added weight from the gun and armour. Massive fuel load (minimum is 1hr & 18min, which adds a lot of weight). Inflexible with roles, can only be used effectively as an attacker and not much else. Single ammunition for 57mm cannon lacks explosive filler: AP-T. The main role of the "Tsetse" was that of anti-shipping and anti-submarine, attacking Axis ships upon orders or while on patrols. When preforming an attack run, the "Tsetse" would dive at 30º from 5,000ft (1,500m), however the auto-loading system was prone to jamming if the plane moved during the attack run. Carrying 25 solid AP rounds, it could fire them at a rate of 55 a minute, running dry in just under 30 seconds. As a result, pilots would fire a burst of 3 to 4 shells before circling around for the next target, also because they risked the ships returning AA fire. Fortunately, the "Tsetse" was fitted with 900lbs (410kg) of additional armour to the engine cowlings, belly and under the cockpit for added protection. Through out its service, the "Tsetse" preformed very well; the effectiveness of the new weapon was demonstrated on 10 March 1944 when Mk XVIIIs from 248 Squadron (escorted by four Mk VIs) engaged a German convoy of one U-boat and four destroyers, protected by 10 Ju-88's. Three of the Ju 88s were shot down. Pilot Tony Phillips destroyed one Ju-88 with four shells, one of which tore an engine clean off its wing. The U-boat was damaged. On 25 March, U-976 was sunk by Molins-armed Mosquitoes. On 10 June, U-281 was abandoned in the face of intense air attack from No. 248 Squadron, and was later sunk by a Liberator of No. 206 Squadron. On 5 April 1945, five German surface ships in the Kattegat were attacked and again, the "Tsetse" demonstrated their value by setting them all on fire and sinking them, a German Sperrbrecher("minefield breaker") was lost with all hands, with some 200 bodies being recovered by Swedish vessels. Some 900 German soldiers died in total. On 9 April, German U-boats U-804,U-843 and U-1065 were spotted in formation heading for Norway. All were sunk. U-251 and U-2359 followed on 19 April and 2 May 1945.